Well, it's a pretty lovely sight, really: Me wearing shorts and a flip-flop while hobbling around with a large black velcro up-to-the-knee boot on the other leg. Brian now affectionately calls me, "Peg" for peg-leg and enjoys making pirate sounds when I walk into the room. The MRI showed no tumor. But there is swelling in the bone (I previously thought it was just around the bone). The doctor said I basically have "stress reaction" which is one step before a stress fracture. Stress reaction in the bone is considered "chronic repetitive stress injury of bone." Basically, I am continuing to injure it as I continue to walk on it. The doctor gave me a DEXA scan to check for osteoporosis but I highly doubt I have that. Without an actual recalled injury to the bone, we just don't know why it's responding the way it is. But what we do know is I have to get off of it or it's going to eventually break. 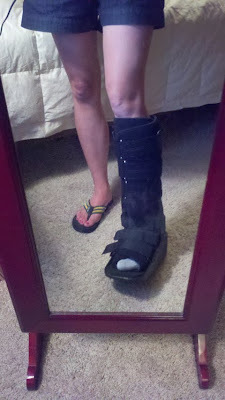 The doctor offered me either crutches or a "boot." Knowing that I have to chase little boys around all day and need to have my hands free, I asked for the "boot." However, if it doesn't heal, eventually I will have to have a cast on it. The worst thing about the cast would be that I cannot take it off (like I can the "boot") and therefore would be unable to drive...not exactly an option at this point. I return to the doctor in two weeks so we can see how things are healing. I still have some pain and still feel like I am putting weight on the swollen ankle bone. So, I'm not exactly sure if the "boot" is working. But, if I need to have a cast, the best time to do so might just be when I'm in the hospital with Bennett for several weeks. I would have more daily help from family and less need to drive. We will see. At this point, the boot is mainly just an inconvenience. Bennett saw the CF doctor today. His lungs continue to sound great. Unfortunately, Bennett has not gained weight in over a month. So, we are having to put him back on his regularly scheduled g-tube feeding schedule. Even the appetite stimulant hasn't shown to have much affect. I'm ok with this decision at this point because I know we are just weeks away from being able to deal with it more directly when we are inpatient. I am also ok because, ultimately, I want him to grow - whether g-tube fed or not. My hope is that he will continue to show interest in food and will continue to eat despite being given more food through his tube. The nice thing is Brian and I attended a CF Patient Education Day at Children's Medical Center in Dallas this weekend and we learned some new things about CFers and their issues with eating. I will write more about this this week but overall, we were comforted to know that we are doing everything right - should it turn out the way we want to, that would be great. If not, we can at least know we've done our best to help balance his need to eat socially with his need to grow in a healthful way. That's one serious boot! Keep us posted! Okay, I had to laugh at the Peg comment and Brian making pirate noises! Hilarious! But, I have no doubt the boot is annoying. Praying the boot works and you don't have to go to a cast. You have a good attitude about Bennett's weight gain. Not much you can do at this point, just upping his g-tube feeds again. Bennett will get there when he's ready. The boot is very glam! Lol! Sorry to hear Bennett did not gain weight. Azer had no improvements on the appetite stimulant either. At least you have tools to work with. Like they said at the hospital, the goal is to get him to gain weight, with or without the G-tube. I really like what they said about the morning sickness and what it feels like for them. Did what's her name email you the slides from the doctor?